Replies: 57 (Who? ), Viewed: 7953 times. #1 8th Dec 2018 at 7:37 PM Last edited by Coriel_Muroz : 17th Mar 2019 at 9:49 PM. Part 11 (post #57) for Ian Burb open now! Who should he marry - Corrie Dreamer or Morganna Goth? So, for the first time ever, I am playing Pleasantview. I'm really enjoying the characters, but I need your help. Sometimes, I get to a crossroad, and I just don't know which decision I should make. So, I'm going to give you a little context about what's happening, and then I will ask you to vote about the next step I should take. I will keep you updated as well as to what happens next, and again ask for more input. Please keep in mind, though, that I do allow random things to happen, so if a sim up and dies, I won't exit without saving to fulfill the previously determined next course of action. Part 1, Part 2 (post #9), Part 3 (post #19), Part 4 (post #24), Part 5 (post 29), Part 6 (#32), Part 7 (#35), Part 8 (#45), Part 9 (#49) and Part 10 (#52) are now closed! Let's start with Dustin Broke! Dustin borrowed from his crime syndicate boss so that he could follow Angela Pleasant to Sim State University. Freshman year went pretty well, even though he had been placed in a different dorm than Angela, and they barely saw each other. Still, away from his mother's constant nagging and with a little bit of money for once, Dustin actually got on the Dean's List and thought his future looked bright. Then Angela broke the news. She was moving in with some guy named Jimmy, whom she met in her dorm. She loved him - unlike the feelings she had for Dustin, which she said were far more based on her desire to escape the toxicity of her parents' relationship before their divorce. Devastated, Dustin ended up on academic probation. His boss is furious with him, his mom is furious too, and Angela really doesn't care at all. What should happen next for Dustin? Which should it be? Vote and let me know. You have until I get through the other households and back to the Sims in University to make your opinion known. B is way more fun.When in doubt, choose the funner option. Yeah I agree. I mean, they seem to be pretty much the same option except in B he actually has some fun. In B, Dustin could be having fun, but in a way that will likely still be destructive. A brings in the possibility of death, although not a guarantee. Both would naturally have cascade effects in the way the rest of Pleasantview would respond to which choice we make. You should also have him try to forget Angela in the arms of multiple men, too. Or get into a polyamorous relationship. I say B maybe he should try to hook up with Lilith. Dustin doesn't strike me as a quitter, so I'd say B. That, or hook up with Jimmy. #9 9th Dec 2018 at 6:30 AM Last edited by Coriel_Muroz : 15th Dec 2018 at 3:45 PM. Thank you for your input about Dustin. I will continue to accept votes on his fate until I play his household again. So far it looks like he's going to party and sleep around and not form any concrete relationships for a while. Cassandra's life did not remotely turn out how she expected. After she was humiliated at the alter by Don Lothario, she felt a great deal of gratitude towards Darren Dreamer. Gratitude she DOES NOT feel anymore. He promised he would become an artist. He promised that she would still have a fairly secure life, if not quite what she had grown up with. It's been 15 years and he hasn't sold a single painting! The first few years were a bit of a blur because they had twins, Corrie and Danna, and then soon after another baby, Imogen. As the girls grew up, Cassandra thought there was a light at the end of the tunnel. Maybe she could make her life what she wanted it to be. But when she got the news - news she couldn't help think was BAD - she knew it would never end. And when the result of her unexpected pregnancy was TRIPLETS? Nope. No, no, no. Not at all what she wanted. So now she has a choice. When she got married, she put aside a decent amount of money for her kids to use for college. Clearly, it's not going to be used for that now. A - Take the money and go. Set herself up in a nice house, just for her. Live the life she wants without all the responsibility, get a butler and a maid and live life as a Goth is supposed to, leaving Darren to finally take responsibility for his own life (as well as 6 kids). B - Use the money to try to make life more tolerable for her family. Add an extra floor so that she doesn't have to move her bed back into the hall. Upgrade the kitchen appliances. Maybe even take a holiday - just her - so she can face the constant demands of being the only real grown up in the house. B, unless your Cassandra has developed as a heartless, selfish person. She might split up with Darren, but she's got access to money and would take the kids with her, given how hapless she's found him. If she doesn't want to look after them herself, that's what nannies are for. Dustin-B,because he's not going to give up his life for anyone. He fought hard to survive this far, might as well have fun. Cassandra-I'd say B, because she's a caring person and what happened to her father's money, anyway? She's one of the heirs to the Goth Estate? B Honestly, as much as I understand not wanting to take care of a twin and a triplet at the same time she's a Family sim, she would be miserable without her kids, especially if she left them in a dire situation. Dustin: B, with a bit of A - one of his lovers is the wife of an "enforcer" in the mob, who has him whacked. 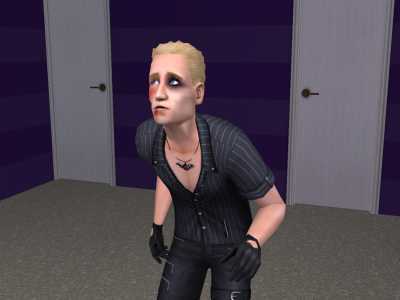 Cassandra: although brought up with money, the Goth house is not really lavish. I think her personality is pretty down-to-Earth. She wouldn't leave her kids, but sounds like she is not happy with doofus husband. Grow up or get out, I say. She doesn't need a man to be happy. Is good-ol dad is still around (has HE remarried?) have him baby-sit so she can make her OWN career. I agree with Grammapat in regards to Cassandra. I think she should leave, but not leave her children behind. If Darren can't be responsible enough to put work behind his art career, how is he going to be responsible to take care of SIX kids? The poor babies would probably be taken by Social Services. Darren has shown that he's lazy and selfish, and he'll become lazier if Cassandra brings home her savings. Also, the children deserve better. They shouldn't be punished because of what situation their father put himself in. Cassandra - B. She isn't the sort to abandon her children, however overwhelmed she feels, so she'll spend the money to give them a better place to live. She might kick Darren out, though, and get a live-in maid. If you have InTeen, a family-aspiration independent teen could be hired as an au pair; otherwise, perhaps there is a poor widow who might be glad of a roof over her head in return for childcare services. She could hire a nanny, of course, but the game's nannies are horrible. Dustin - C, he tries to break up Jimmy and Angela to get her back. Cassandra - A, but she should take the kids with her. She's a family Sim who was as to say desperate to have children at the start of the game, now she has them. Maybe just wait until the triplets are out of the toddler phase so she wouldn't be the only one who takes care of them. Cassandra should move out to the fancy mansion, but bring the kids with her. Then she should fall in love with either the butler or the maid. Dustin and Darren should get together, because in your game they're both losers. Plus their names both begin with D.
#19 11th Dec 2018 at 12:28 AM Last edited by Coriel_Muroz : 27th Dec 2018 at 5:39 AM. Alright! Thank you, everyone, for voting on Dustin's fate - voting for Part 1 (#1) is now closed. Option B - Dustin starts to party frequently and tries to forget Angela in the arms of multiple other women. If you want to share your opinion still, please do so, but we are following the democratically decided path! I will keep you up to date on what happens to him, and since you picked that he would indulge in partying and women, rather than into a deep depression resulting in potential death, you will get to vote on his story again the next time he comes to a crossroads. Now, let's open up Part 3! When Dina Goth married Mortimer, she expected to have not another care for the rest of her life. She would have a great, sensitive guy who would appreciate that she wouldn't take off like his first wife; she would have plenty of money and every material thing she could possibly want; she would soon be independent again, since he wasn't exactly young. That was not how things worked out. Instead, Dina constantly felt anxious about Mortimer. Now that she knew him, she couldn't imagine he would just let his wife disappear without spending every dollar to know exactly where she went and bring her back. That he allowed people to believe she simply ran off made her suspect that he actually knew exactly where Bella was - perhaps she was the reason for the cold sensations Dina sometimes felt in the Goth mansion. And he didn't really seem to be getting any older. Mortimer only asked Dina for one thing - a son. He did have a son, Alexander, but Alex was gay and was unlikely to agree to fathering a child while married to a woman. It wasn't something a modern person would do, which Mortimer did seem to understand. But that meant he needed another male heir to pass on the family name and genes. She hadn't thought it would be that hard, but two daughters and a miscarriage later, she was concerned about holding up her end of the deal. What would Mortimer do if she failed to give birth to a boy? What should she do to save herself? A - Tell Don Lothario - he may have helped Bella escape, so perhaps he could save Dina too? B - Get pregnant and find another mother with a similar due date who is having a boy. Then pretend she gave birth to twins and present the boy to Mortimer as his. Letter B- I really want to see that tea spill and would b a funnier plot to see. And also because I don't believe that Bella escaped she was somehow abducted by aliens or maybe even murdered. Cassandra - I can't imagine her ever leaving her kids, no matter how tough it is with twins and triplets, so it's a B from me. What about using some of the money to build a small extension (an extra floor isn't always necessary) to create another room or two, keeping the rest in savings? Dina - A on that one. The idea of kidnapping a baby from another mother sits too uncomfortably here. However, that might just be my headcanon regarding Dina marrying for love, rather than just money! Dina - B. It fits someone who thinks of her husband dying as being free again. Also, it opens ways to a lot of drama. I'd go for B, mostly because if Dina is having second thoughts about Mortimer, it means she'll do anything to keep him happy-and what about the idea that perhaps Bella left Mortimer because of his insistence on having a son who would in turn have a family? Mortimer is many things but self-serving sometimes doesn't seem to be factored in. Perhaps it should be. Dina (in my view) is often the target of scorn simply because she wants security after a lifetime of insecurity. #24 13th Dec 2018 at 5:02 AM Last edited by Coriel_Muroz : 27th Dec 2018 at 5:39 AM. Dustin started to come out of his depression over Angela dumping him by drinking and getting friendly with women without having any desire for commitment. Still a Fortune Sim, he now has Romance as his second aspiration. It wasn't soon enough - he failed out of college and was sent back to Pleasantview. There he got an apartment Downtown with his buddy from work, Russ. His boss, who had had a soft spot for Dustin since he had been such a hardworking and dedicated teen, had paid for the education he wasted. He is also paying for the apartment for Russ and Dustin. Keep your friends close. However, as soon as they were back, Dustin went on an errand downtown and no one saw him for the next four days. A party fest, he doesn't even remember the details. When he got back, his boss was furious. Some henchman beat him up and he was told not to reach out to any of his contacts. His boss told him in no uncertain terms that the arrangements between them were over. The thing is, no one really ever leaves the Llama Mafia. So, what is going to happen to Dustin next? Option A - The Llama Mafia doesn't leave loose ends and Dustin definitely is one. He will make attempts on Dustin's life until he is either successful in ending him or until Dustin ends up in witness protection. Option B - His boss relents and gives him one more chance. He must seduce Dina Goth, the wife of the wealthiest man in town, and steal at least $25 000 to pay back the Llama Mafia. Then, he better not screw up again.